Did you know that apart from culinary uses, Lemon Basil is also important in the nutraceutical, pharmaceutical and cosmeceutical industry? The nutraceutical industry use its vegetal derivatives- the nutritious content, to provide a health benefit based nutrition including vitamins and supplements. 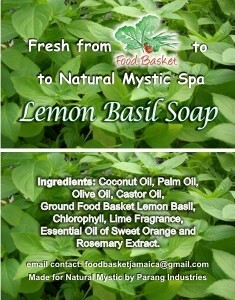 Lemon Basil is great at combating illnesses and diseases caused by a high fat and cholesterol diet. It contains phytochemicals which have health-protective and disease preventing properties. It really is quite necessary for health and wellness. Aside from the nutraceutical benefits of Lemon Basil, it goes beyond the nutritive –health and food enhancing benefits and right on to cosmeceutical benefits with its healing and beautifying properties. It contains natural colors, inherent preservatives, oils and other exudates that are tapped for cosmeceutical (soaps, face creams, lotions and eye serums) purposes. This healing and beautifying plant is important in the spa industry and it has therapeutic benefits. It is an antidote to the fast-paced lifestyle that we live in this Information Age. The essential oils that are extracted have antibacterial, antiviral, antifungal and anti-protozal elements. Like cosmetics, cosmeceuticals are topically applied, and in dermatology, the plant is useful against allergies and bacterial infections, diseases of pigmentation, fungal infections, mycobacterial infections, nails, papulosquamous diseases, parasitic infections, reactive and inflammatory dermatoses and surgical and viral infections.